The Isle of Artaeum (/ɑrteɪʌm/ Ar-tay-um) is the third largest island of the Summerset archipelago, located off the southwest coast of Summerset Isle, south of the Moridunon village of Potansa and west of the mainland village of Runcibae. 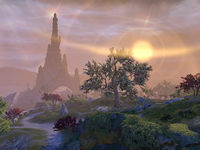 Artaeum is the home of the Psijic Order, the oldest monastic group of Tamriel. It has a tendency to vanish from Nirn, being placed in a pocket realm for centuries at a time. This page was last modified on 18 December 2018, at 22:59.